Specializing in romantic soft rock love songs from the last 5 decades played peacefully on solo guitar, David's special blend of music adds warmth and elegance to any gathering. 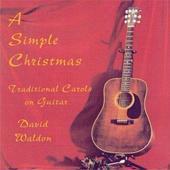 David Waldon's Christmas style is so good that it was even recognized by well known NPR critic Richard Banks . If you want to hire the best and have a budget, David Waldon is your clear choice! David is also an excellent wedding, private party, and elegant venue instrumental guitarist. He has a 4 hour repertoire of soft rock love songs from the Everly Brothers up to Green Day, plus several fine original songs. David's unique acoustic guitar stylings add specialness and fun to any occasion. David was on time, very kind and a pleasure to work with. We will definitely book him again next year!! He's a pleasant person and very talented. Only issue I had was that I wanted to have a phone conversation with him and didn't get prompt call backs, but he was easy to communicate with via email and everything went off without a hitch. He played at the rehearsal dinner as well as the ceremony. Definitely recommend him. Received a lot of positive comments from guests. We would certainly seek his services in the future and definitely recommend David to others. Very accomodating. Talented and very thoughtful. I will use him again. David was great! He was on time, easy going, and polite. He played exactly what we had asked, showed up on time and played very well. Please note David Waldon will also travel to Sachse, Plano, Allen, Lavon, Rowlett, Garland, Richardson, Josephine, Nevada, Fate, McKinney, Princeton, Rockwall, Dallas, Copeville, Farmersville, Royse City, Mesquite, Sunnyvale, Addison, Frisco, Melissa, Caddo Mills, Carrollton, Forney, The Colony, Blue Ridge, Westminster, Anna, Prosper.